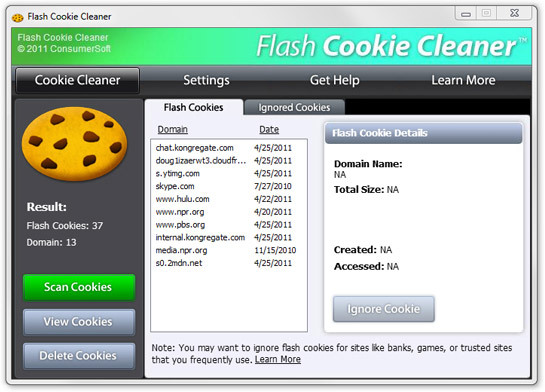 ConsumerSoft is proud to offer Flash Cookie Cleaner, our freeware application that let's you view, manage, and delete your Flash cookies. New in Version 2.0: Automate the cleaning process with our Scheduler and add cookies to the Ignore List if you don't want to delete them. • View and delete your Flash Cookies. • Ignore List lets you save cookies you want to keep. • Scheduler lets you automate the cleaning process. • Best of all, Flash Cookie Cleaner is free!